Form the chicken into four 3/4-inch-thick patties and season with salt and pepper. Transfer to a plate and refrigerate until firm, 30 minutes. In a small bowl, whisk the mayonnaise with the fish sauce and lemon juice until smooth. Sprinkle both sides of the patties with the Old Bay. In a large cast-iron skillet set on the grate of a preheated grill or on the stovetop, heat 1 tablespoon of the oil. Cook the burgers, covered, over moderate heat, flipping once, until browned and just cooked through, 8 to 10 minutes. Transfer to a work surface and let rest for 5 minutes. In a large nonstick skillet, heat the remaining 2 teaspoons of oil. Arrange the cheese slices 2 inches apart in the skillet and cook over moderate heat until melted in the middle and browned and crisp at the edges, about 3 minutes. Remove from the heat and let the cheese rest in the skillet for 1 minute. Transfer to a paper towel–lined plate to drain. Spread some of the mayo on each roll bottom and place a burger on top. 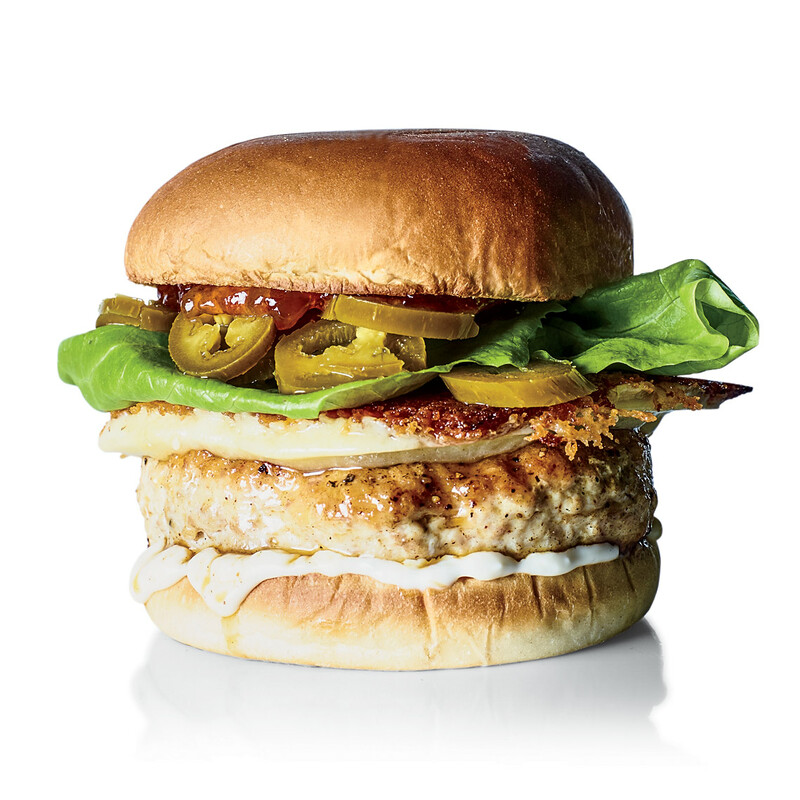 Layer with a slice of crispy cheese and some lettuce and pickled jalapeños. Spread the pepper jelly on the roll tops, close the burgers and serve. Review Body: The crispy cheddar cheese looks serious! Review Body: I prefer this burger with bacon instead of pickles. Review Body: This is ideal for those of you who want a lighter option in your menus.